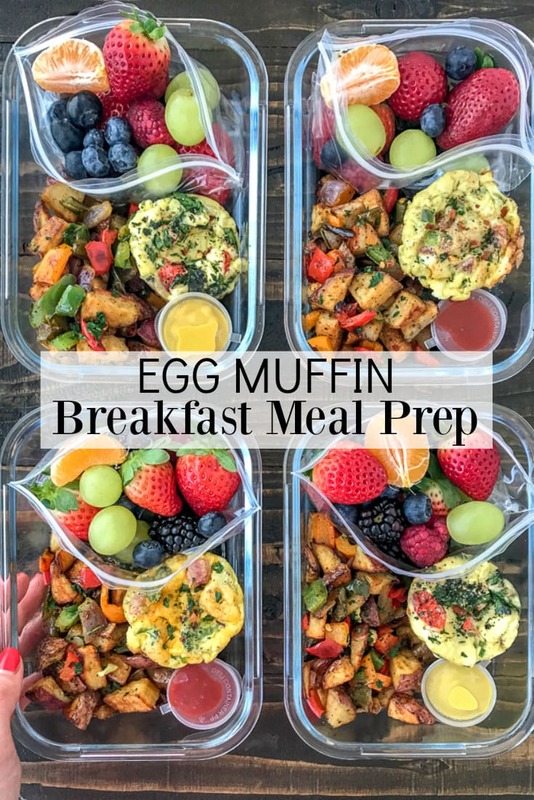 This Egg Muffin Breakfast Meal Prep should be on the list for your upcoming meal prep day! 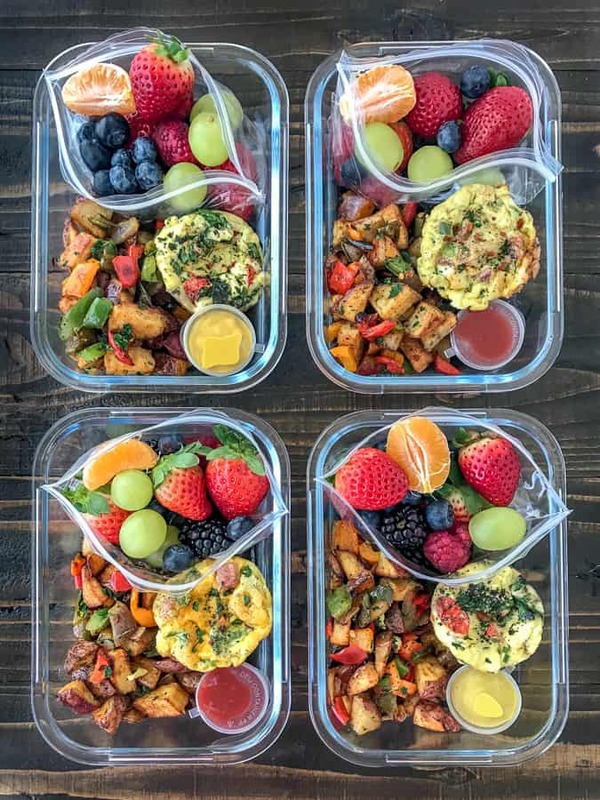 This meal prep is loaded with Egg Muffins, Breakfast Potatoes, and a hearty serving of mixed fruit! Make ahead egg muffins done three ways: with ham, cheese, spinach, tomatoes, bacon, and peppers! The breakfast potatoes are cooked with potatoes, peppers, and onions – all cooked on one sheet pan. They say that breakfast is the most important meal of the day. That it should be healthy and filling, whereas your lunch and dinner meals should be smaller. I do try my best to follow that, but when a girl is hungry at 9am, you better believe I’m going to eat something! I try to make it a banana, but sometimes its more like a spoonful of peanut butter.. or two. Can’t go to bed hungry, now can we? But who has the time to dedicate every morning to making a filling, healthy and delicious meal? Not when the only time you have is to pull yourself together and grab a coffee as you’re rushing out the door! The solution to this dilemma? 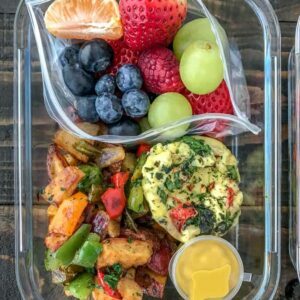 Breakfast meal prep! Don’t just prep your lunches, snacks, and dinners. Prep the most important meal of the day, too! So grab your meal prep containers, a few dressing containers , and some sandwich baggies. Time to meal prep breakfast! Round up the ingredients and let’s get this breakfast show on the road. 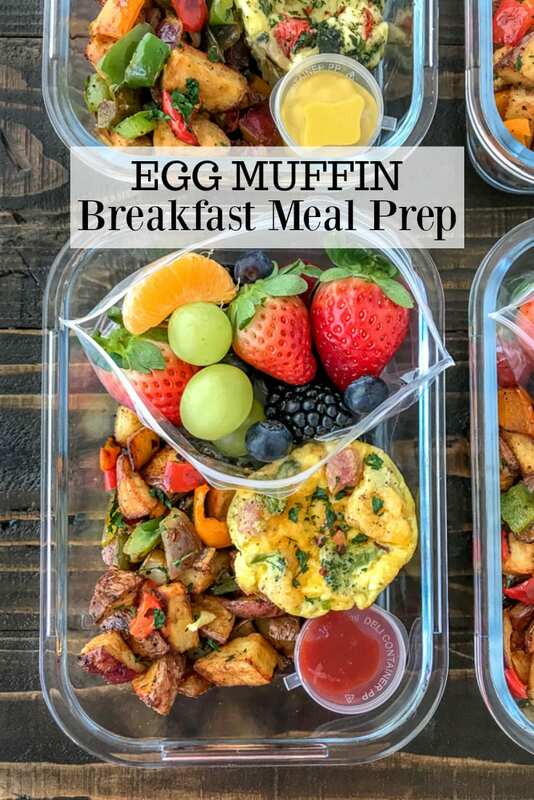 Soon you will be packing these Egg Muffin Breakfast Meal Prep containers into your refrigerator, ready to grab as you’re running out the door with your coffee tomorrow morning! 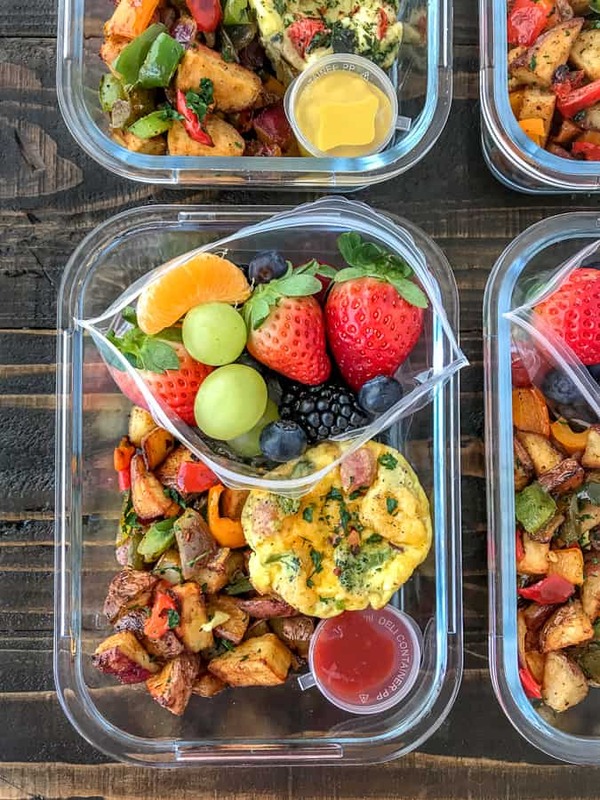 Easy Sheet Pan Breakfast Potatoes – follow this recipe for an entire sheet pan divide among 4 meal prep containers. Make Ahead Egg Muffins – 3 Ways – three different and delicious egg muffins to choose from. Make all three to keep breakfast a bit different each day or one of your favorites! Side of fruit: your favorite kind! In mine: Strawberries, blackberries, blueberries, grapes, and mandarin orange slices. Your favorite breakfast condiment – ours are always ketchup, mustard, or hummus. 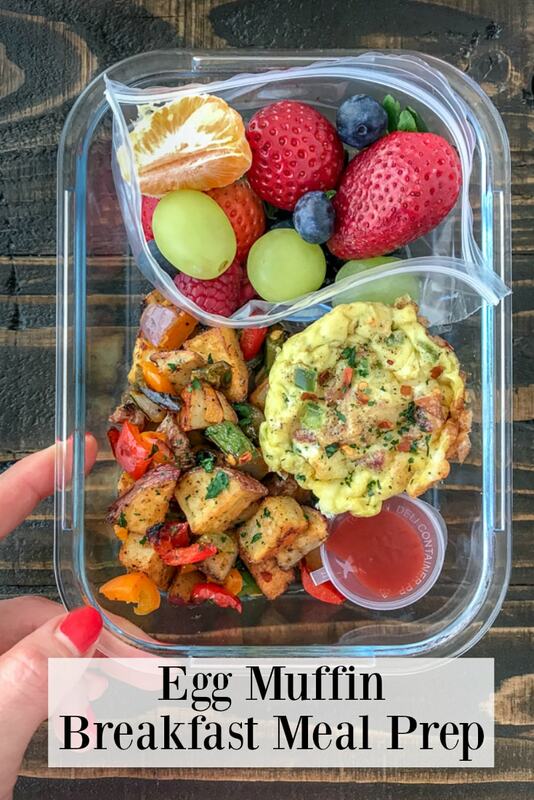 A filling, easy to make, and delicious breakfast meal prep option that you are going to absolutely love! You can make 1/3 of the Egg Muffin recipe to fill 4 meal prep containers, 1/2 of the recipe to fill 4 containers with 8 muffins, etc. I find that 1 muffin with the breakfast potatoes to be filling. 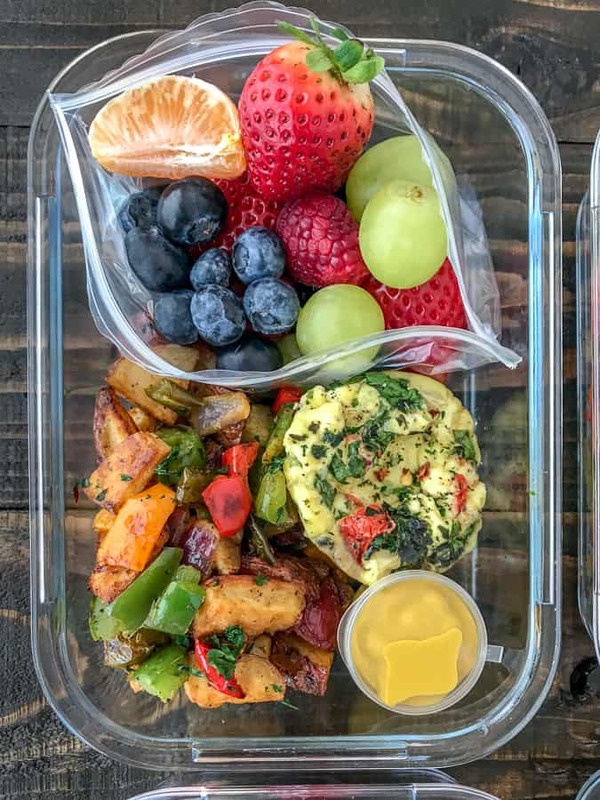 Divide the cooked egg muffins and breakfast potatoes between 4 meal prep containers. Add the fruit to separate sandwich bags with a folded paper towel and seal. The paper towel will help absorb moisture as the fruit sits. Refrigerate until ready. Remove the fruit (if in the container) and reheat. 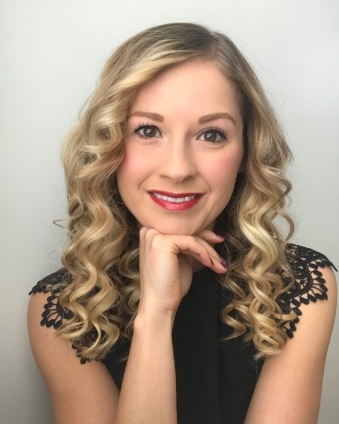 Calories listed in nutrition label below are for 1 serving of 4: 1 egg muffin, 1 serving of breakfast potatoes, and 1 cup of fruit.